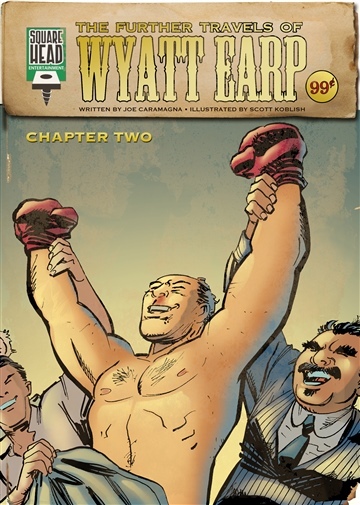 After swearing off a career in law enforcement, Wyatt Earp was a saloon owner, horse racer, card dealer, gold miner in Alaska and even had a brief, but controversial career as a boxing referee! But everywhere he went, no matter what he did, he couldn't shake his famous reputation. And sometimes, a good reputation can be your worst enemy. 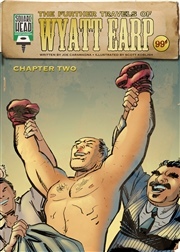 The Further Travels of Wyatt Earp is a five issue full-color digital comic book series by Joe Caramagna (Amazing Spider-Man, Iron Man & The Armor Wars, Marvel's Avengers Assemble, Giant-Size Spider-Man) and artist Scott Koblish (Deadpool, Marvel Adventures, Wolverine: First Class, World's Finest) that looks at what Wyatt's life might have been like in those later years. 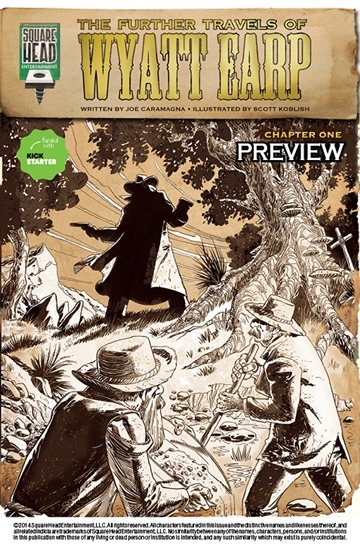 This is an extended preview of The Further Travels Of Wyatt Earp #1 on sale April 15th! Writer: Joe Caramagna is a writer/letterer for Marvel & DC Comics. His writing credits include Iron Man & The Armor Wars, Marvel Universe Avengers Assemble, Marvel Universe Ultimate Spider-Man, Fear Itself: Thunderbolts, Free Comic Book Day Rocket Raccoon and MORE! He is also the writer of the Amazing Spider-Man series of young readers novels. Artist: Scott Koblish is a cartoonist who has worked in comic books, animation, storyboards, movies and advertising for the past 20 years. Scott's pencil work includes Marvel Adventures: Iron Man, Excalibur, Cable, Marvel Adventures: Super-Heroes, and the Jet Pack Pets, as well as Platinum Studios’ well-received 4-issue comic series, The Weapon. He has inked over 300 comics for Marvel and DC, with runs on Thor, Hulk, Captain America, Worlds' Finest, and O.M.A.C. He’s done storyboards for independent films and worked as an animator for Stan Lee Media, BNS and Sandglassair. Colorist: Andrew Edge is a graduate of the Joe Kubert School. He currently self-publishes his own comic book series Grizzly and Caticus from Cool Monkey Press (www.coolmonkeypress.com), which he writes and illustrates. Andrew has also worked at McFarlane Toys as a prototype painter working on lines as diverse as Spawn, Wallace and Gromit, Aliens vs. Predator, NFL, NHL, Conan, and NASCAR. He has also worked for McNabb Studios as a colorist, whose list of clients included Marvel Comics and Comic Images. Designer: Melissa Horvath-Plyman is an art director who has over fourteen years of experience in the advertising industry. She has created designs in all mediums (print, digital/web, interactive, mobile/tablet, video, event, editorial, etc) for clients including Panasonic, Nintendo, IBM, Nike, Maxim magazine, Prentice Hall, Colgate-Palmolive, Procter & Gamble, NYU, and many more. She has also taught graphic design classes at Boston University and City University of New York (CUNY). Editor: NATE COSBY is a writer, editor and producer. He was a producer/writer for PBS' relaunched The Electric Company, where he developed animated properties. He was an editor at Marvel Entertainment, overseeing acclaimed series including the Harvey Award-winning Thor The Mighty Avenger, the Eisner Award-winning Wonderful Wizard Of Oz and Marvelous Land Of Oz, as well as X-Men First Class, Spider-Man, Pride & Prejudice, Hulk, Spider-Man Loves Mary Jane and many others. He co-wrote/edited the Harvey Award-nominated Jim Henson's The Storyteller for Archaia Entertainment. He currently writes the acclaimed Cow Boy for Archaia, Buddy Cops for Dark Horse Entertainment, and co-writes Pigs for Image Comics.